Reports yesterday brought sad news of the passing of consulting engineer Ron Rackley. If you’ve listened to AM, you’ve benefited from his work. LTE in unlicensed and shared spectrum remains at an “early stage” worldwide with interest “high,” according to a report published by the Global Mobile Suppliers Association (GSA). Technologies discussed in the report include LAA, eLAA (LAA with uplink support), LTE-U, LWA (LTE Wireless-LAN Aggregation), LWIP (LTE WAN Integration with IPSec tunnel), and US-oriented CBRS. These are described in the report. The Global Mobile Suppliers Association (GSA) has provided a snapshot of 5G spectrum activity around the world as of the end of December 2017. “Activity” can include plans, trials, and regulatory consideration. The bands range from 600 MHz to 86 GHz. There’s some inaccuracy as GSA depends on incomplete information from some regulators, operators, and vendors, but it’s the best collection of public domain information. At its January 30 meeting, the FCC will likely vote to approve an item that would lead to improvements in Wireless Emergency Alerts, primarily by requiring that alerts be delivered with more geographic precision — as close as is practical to a target area specified an alert originator. This is intended, in part, to reduce the potential for over-alerting and resultant subscriber opt-out of receiving alert messages. Among other things, the item would additionally require that WEA-capable mobile devices preserve alert messages for 24 hours after its received. A proposal for concurrent multi-band Wi-Fi was brought into the most recent meeting of working group IEEE 802.11. Similar to how mobile broadband can use multiple bands at the same time, the proposal would allow a Wi-Fi connection to use the 2.4 and 5 GHz bands simultaneously. Data would be split based on instantaneous channel conditions. The Global Mobile Supplier’s Association (GSA) has started tracking the use of unlicensed spectrum to improve LTE throughput. It recently issued its first in a series of quarterly reports. The report can be downloaded following a registration process. NTT DOCOMO researchers discuss 3GPP’s 5G radio standardization process in the March 2017 issue of NTT Technical Review. 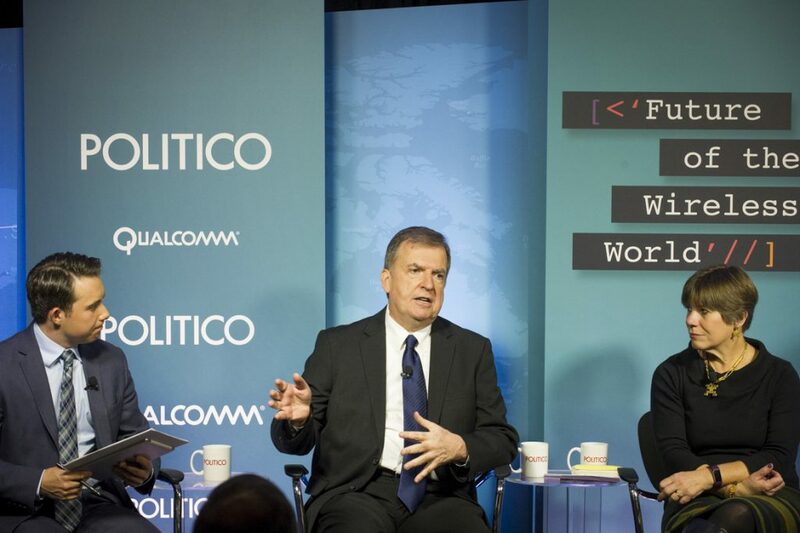 I was pleased to participate in this March 7 event presented by Politico and Qualcomm. The event page with video is here. A recent meeting of the Association of Federal Communications Consulting Engineers (AFCCE) hosted Dr. Andrew Clegg from Google. He updated the group on the status of the 3550-3700 MHz Citizens Broadcast Radio Service (CBRS). Google has been an active proponent, including through work in the Wireless Innovation Forum (WinnForum), which is developing spectrum-sharing standards. Straight Path Ventures today filed an application and supporting exhibits for an experimental license to support the development of “radios that can support 5G fixed and mobile services in the 39 GHz band (38.4 – 40.0 GHz).” Straight Path Ventures is affiliated with Straight Path Spectrum, which recently agreed to pay a $100 million civil penalty in a consent decree with the FCC. Straight Path announced a demo of 39 GHz technology last October.